I do not enjoy chopping onions! I know there are ways to cut down on the fumes so you don't cry - like keeping the onions cold and not cutting into the root, but I still don't enjoy the odors. I do it anyway of course! But I do have a product I use when I feel the need for an onion shortcut. Frozen chopped onions work for me! I love having these on hand. Sometimes I only need a little onion in a recipe and sometimes I don't have a fresh onion on hand, and sometimes I just don't feel like chopping the onion - LOL! These are just simply sweet Spanish onions that are chopped and frozen - nothing added. I do find it very amusing that they have to show us that there are no trans fats as if there would be in onions! These are kept frozen - I just throw some into soup right from the freezer or into the frying pan to saute slightly for a recipe. I suppose you could do this yourself by finely chopping up onions, spreading them on a sheet to freeze and then bagging them. This is just easier for me! 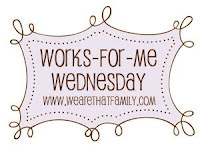 Stop by We Are THAT Family (she has the most excellent eggshell tip today) to find out what's working for everybody else today! Thanks for stopping by and have a wonderful Wednesday friends! Interesting. I've never seen these in the grocery store. I buy the large yellow Spanish onions - they don't give off many fumes. I find wearing contacts helps a lot too! 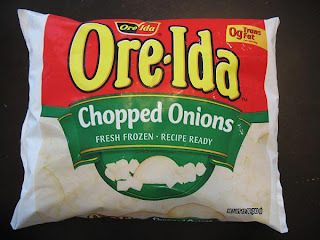 I have found chopped frozen onions in a couple different areas in stores - either with the frozen veggies or with the tater tots, hashbrowns and frozen breakfast foods. I buy these at WinCo, but have seen another brand at other stores. Hope that helps! I've never seen these either. But I will definitely look for them now. Thanks for sharing! That's a GREAT idea...I also hate to chop onions!! I rarely use onions, but when I do, I go this route too. It's so much easier and quicker! That's a neat idea. I'm a SEVERE eye burner when it comes to chopping onions, it's bad. If Kim's here, I'll ask her to do it, her's don't burn! Great idea. Lisa! I have contacts so the onion fumes don't bother me too much, but this sure would speed up dinner preparations! That's pretty neato! As long as I have my contacts in and covering my retina, my eyes will never tear up. So I make sure I'm not wearing my glasses when I cook! LOL! Big Tears belong on your pillow not on your food size hugs to you! I must find some of these! My eyes tear and burn so bad that I literally can't see a thing in the kitchen. When I was growing up, I remember my dad chopping onions in the kitchen...and I would be in a completely different room and still feeling miserable from the fumes.